^ Citype – Internet – Portal Betriebsges.m.b.H. 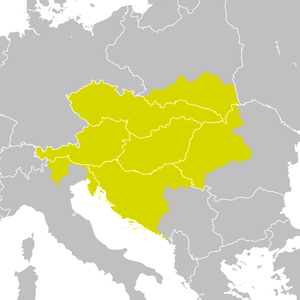 Austro-Hungarian Empire k.u.k. Monarchy dual-monarchic Habsburg Emperors of Austria. Wien-vienna.com. [11 September 2011]. （原始内容存档于2011年11月23日）. 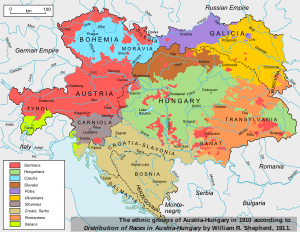 ^ Thomas's Glassware Tour: Languages in Austria-Hungary 1910. Thomasgraz.net. [11 September 2011]. 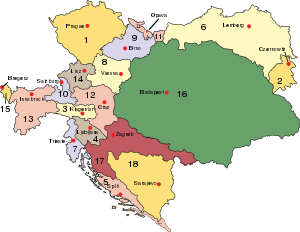 ^ Austria-Hungary – LoveToKnow 1911. 1911encyclopedia.org. [5 May 2009]. （原始内容存档于2012年5月9日）. Headlam, James Wycliffe. Austria-Hungary. (编) Chisholm, Hugh. 大英百科全書 3 第十一版. 劍橋大學出版社: 2–39. 1911年. Jayne, Kingsley Garland. 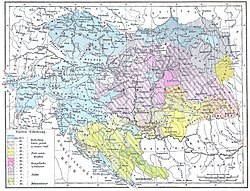 Bosnia and Herzegovina. (编) Chisholm, Hugh. 大英百科全書 4 第十一版. 劍橋大學出版社: 279–286. 1911年. ^ Publishers' Association, Booksellers Association of Great Britain and Ireland. The Publisher, Volume 133. 1930: 355. ^ Contributors: Austria. Österreichische konsularische Vertretungsbehörden im Ausland; Austrian Information Service, New York. Austrian information. 1965: 17. ^ Seton-Watson, R. W. "The Austro-Hungarian Ausgleich of 1867." The Slavonic and East European Review 19.53/54（1939）: 123–40. ^ Tihany, Leslie C. "The Austro-Hungarian Compromise, 1867-1918: A Half Century of Diagnosis; Fifty Years of Post-Mortem." 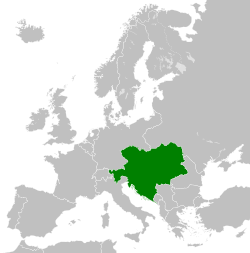 Central European History 2.2（1969）: 114–38. ^ Analysis: Austria's troubled history. BBC News. 3 February 2000. ^ "Britannica 1911". 1911encyclopedia.org. Retrieved 24 March 2012. ^ Tucker, Spencer; Priscilla Mary Roberts (2005). Encyclopedia of World War I（1 ed.）. ABC-CLIO. p. 1183. ISBN 978-1-85109-420-2. "Virtually the entire population of what remained of Hungary regarded the Treaty of Trianon as manifestly unfair, and agitation for revision began immediately." Jászi, Oszkár The Dissolution of the Habsburg Monarchy, Chicago : University of Chicago Press, 1966. Sked Alan The Decline And Fall of the Habsburg Empire, 1815–1918, London : Longman, 1989. Geographischer Atlas zur Vaterlandskunde an der österreichischen Mittelschulen.（ed. : Rudolf Rothaug）, K. u. k. Hof-Kartographische Anstalt G. Freytag & Berndt, Vienna, 1911.